... digitally with a user-friendly touchscreen that can be adjusted for optimal viewing. Power is displayed in Watts and Neuro Units with total coagulation time shown as well. 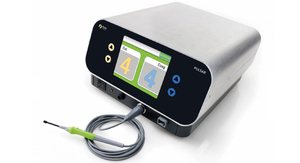 An electrosurgical unit is a surgical instrument which uses an electrical current to cut or coagulate tissue. Some of these devices also are used for dessication, dehydrating the tissue to facilitate its removal. Another option is fulguration, the destruction of tissue by applying an electric current. Most such units use a high-frequency current. Cutting and coagulation can be monopolar, using a single electrode, or bipolar, in which the current passes from an active to a passive return electrode. Some use laser positioning to facilitate surgical orientation and precision.